Bromleys has won a top honour at the 2018 Manchester Legal Awards. The practice was named law firm of the year for those with between one and five partners. 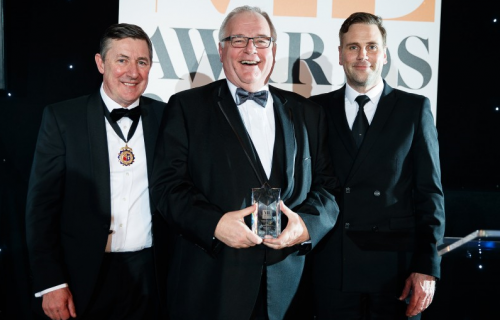 Around 650 people attended the ninth annual awards ceremony at Manchester’s Midland Hotel, which attracted a record number of entries. Mark Hirst, senior partner at Bromleys, who is pictured with the trophy, said: “We are absolutely thrilled to win this award. “It’s tremendous recognition for the all-round strength and excellence of the practice and our commitment to providing a service of the highest quality to our clients. The award judges praised Bromleys for the way in which the firm combines tradition with a modern approach. They also highlighted Bromleys’ expertise, commercial approach, strong leadership, commitment to staff welfare and development and involvement in the community. Bromleys’ accolade follows its triumph at the 2017 Pride of Tameside Business Awards in November, when it won the corporate social responsibility prize. It crowns a hugely successful 12 months for the firm, during which it has made a string of key appointments to cater for a growing number of instructions across Greater Manchester and beyond, and has been recognised with a series of accreditations, including retaining Investors in People Gold status and the Law Society’s Lexcel quality mark.